The PCL423 has been superseded, please see the PCL1000 Series as a possible substitute or consult OMEGA's Pressure Engineering department. 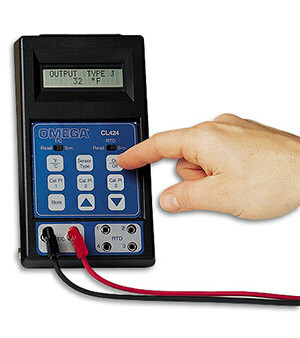 The OMEGA ® PCL423 is a portable, handheld, microprocessor-based calibrator for process voltage and current signals. The PCL423 process signal calibrator has multiple input and output ranges for dc millivolts, volts and milliamps. In the milliamp range, it can supply 24 Vdc to power a two-wire transmitter while simultaneously displaying its output in milliamps or % of full scale. It utilizes a large 32-character dot matrix display to simultaneously display the reading, operating mode (input or output) and range selected. For convenience, three calibration points can be stored for each range for quick recall. 참고: The PCL423 comes with carrying case, test leads, 4 AA batteries, and operators manual.